Get ready for a wild ride with Off The Rails. This unique board game is ever changing and always different each time you play. Players will place their rail tiles to create different paths while special cards attempt to ruin tracks and cause havoc. Can you collect the most jewels all while avoiding collisions with other players? 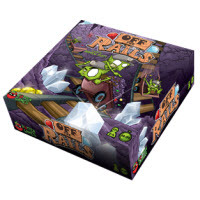 Off The Rails comes complete with impressive graphics and great build quality in it's custom game pieces. Game play is simple and easy to understand so learning how to play doesn't take a long time. The game is somewhat lengthy coming in at about an hour to play but it will be an hour well spent. Check out Off The Rails today and add it to your collection. The player with the highest value of Jewels retrieved wins. Included is 1 game board, 33 deposit cards, 8 speed dice, 20 chasm tokens, 11 mission cards, 8 plastic mine carts, 66 plastic jewels plus a bag, 90 double-sided track tiles, 4 jewel shield stockpiles and the official Off The Rails game rules and instructions. Please keep in mind that the official Off The Rails board game rules and instructions could be different depending on the game version you have. The rules below are some of the exact directions on how to play Off The Rails. Share with us your comments, funny stories, tips, advice, strategies, creative ways to play, questions about how to play, problems with the rules or anything you want about Off The Rails. All submissions will be reviewed within 24 hours. Click here to add your Off The Rails comments.